First, I am so excited to be able to announce that I will be at Fibre Space in Alexandria, Virginia on May 3rd for a workshop and separate book signing event! Give them a call (703) 664-0344) if you are able to come to either the workshop or the signing or both. Everyone is welcome. Then I will be off to the Maryland Sheep & Wool Festival for the first time on May 4th and 5th for book signings (and hopefully some shopping, fingers crossed I will have time). Let me know if you are going to either of these events. I'd LOVE to see you there. 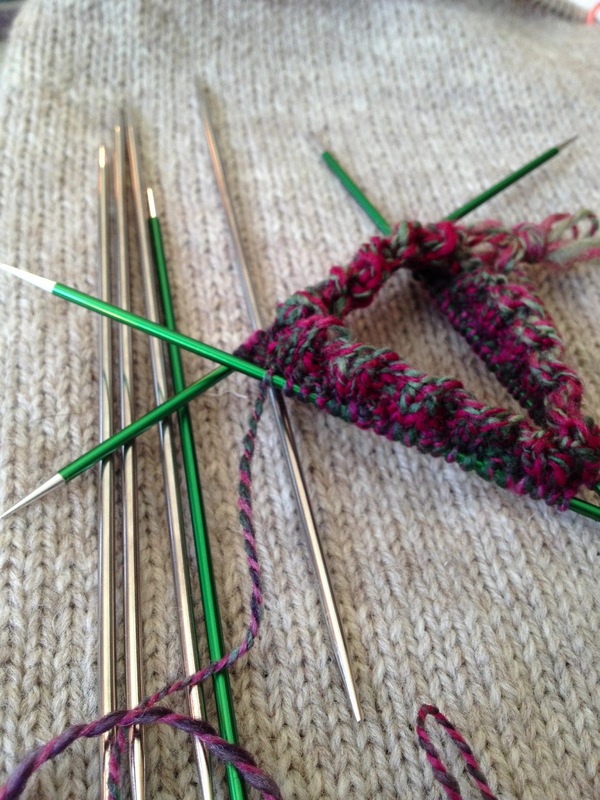 Now onto knitterly goings-on. I'm off to an extra early start this morning. My girls don't have school today and my son is taking the bus home from college for a long weekend. He will arrive after dinner tonight. I know it will turn into a hectic day (getting food for my ravenous college boy alone is hectic) so I am trying to get some work things done before the day starts rolling for everyone else. Plus, we are having another blizzard as an added bonus, lots of snow and ice this winter. It's not for the weary. I want to share some photos and chat for a moment about some things I am currently working on, both work-wise and fun-wise. 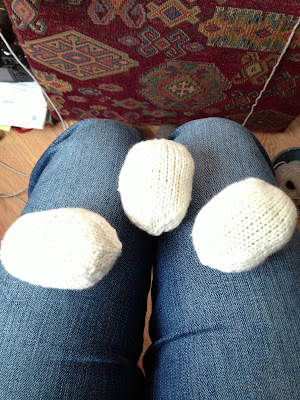 I finished up writing the pattern and knitting samples for the Egg to Turtle reversible toy. It is all off to good old NYC (Artisan Books) for photos, editing and pattern card production. It turned out really, really great! 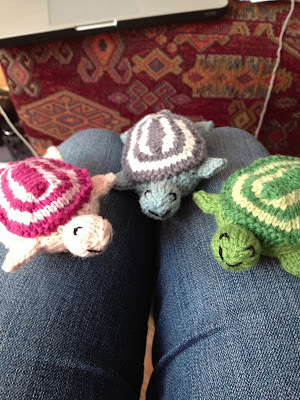 The turtle is knit in one piece, no seaming at all. Here are the eggs that when you flip them over and turn them inside out they become the tiny turtles. The egg is knit separately and the only seaming is to whipstitch the egg to the turtle around the small opening. 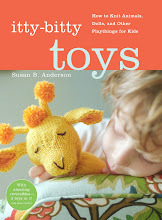 I knit these toys in Quince & Co. Lark, a worsted weight wool. 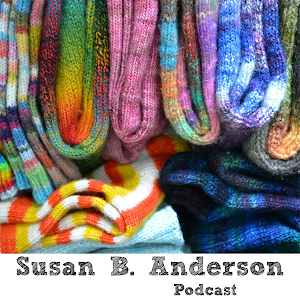 It is such great yarn, reasonably priced, with a wide and wonderful range of colors. 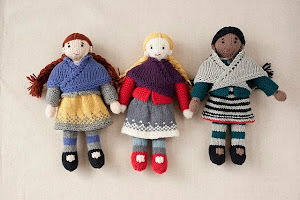 I have a big bag of leftovers setting right by my main knitting chair and I keep pulling out colors to whip up little toys, fair isle hats, fingerless mitts, tiny sweaters, and so on. 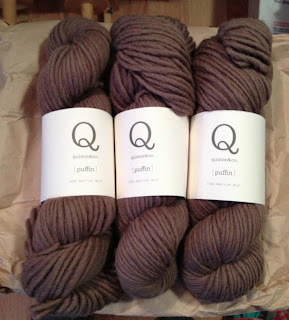 I swear that every knitter should start collecting skeins of this wonderful wool in every color just to have on hand. I received a lot of questions, dozens and dozens, about how to get the Egg to Turtle pattern so instead of trying to answer everyone individually I am going to answer on here. 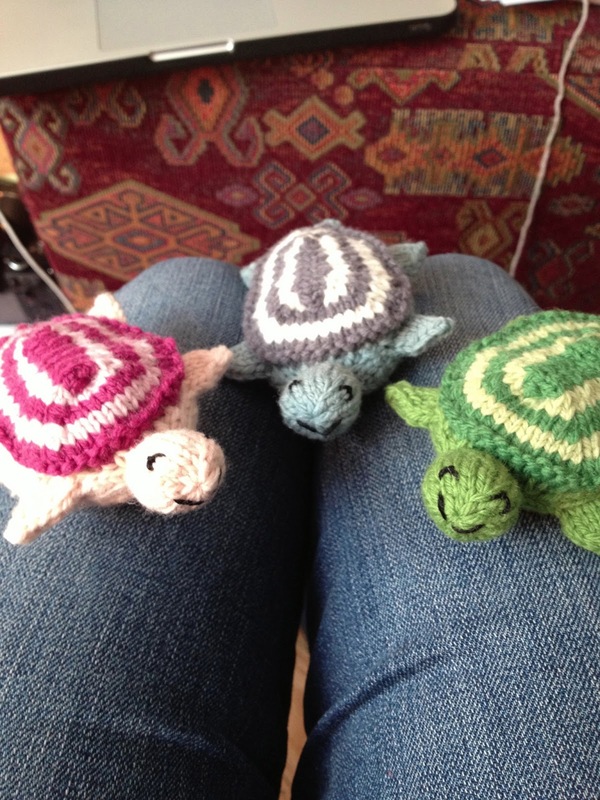 The pattern for the Egg to Turtle is now a promotional free pattern only. 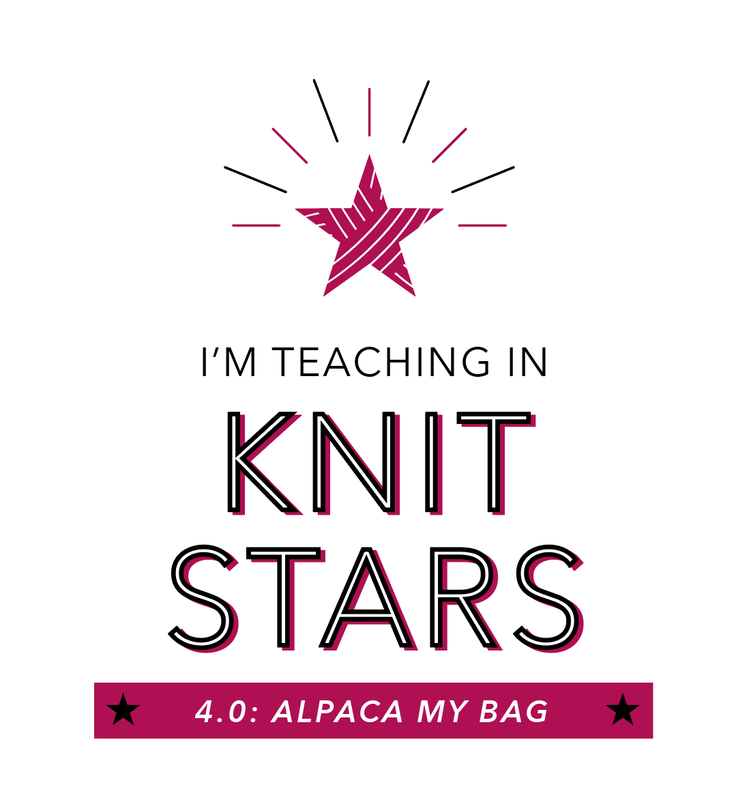 I am going to have the pattern with me on a slick pattern card to hand out as a free bonus pattern (it's not in Topsy-Turvy Inside-Out) to knitters at my book tour events, book signings, and workshops. I am doing these events over the many months ahead. Eventually, when the touring is done I plan on adding this pattern to my Ravelry Pattern Shop as a pdf download but I don't know exactly when that will be at this point. I'll keep you posted on here when it becomes available. 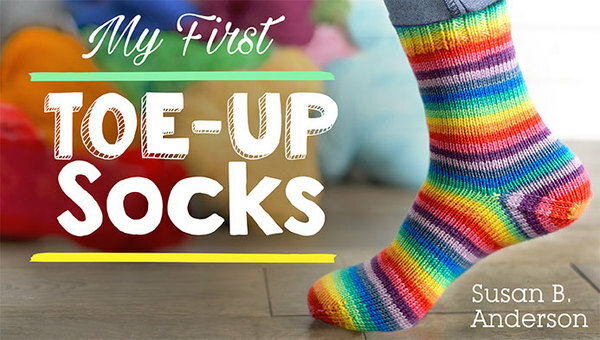 Now for some personal knitting, I finally finished the Rainbows and Clouds socks (click here for the etsy shop). Three cheers! I was sitting at a long swim meet last weekend and knit my heart out on these while watching. When I got home from the meet I only had to finish up the toe on the second sock. Here is the finished pair all squishy and cozy on my feet. These feel like heaven. The yarn is vibrant and I love the variegated cloud stripes. I don't know how Abbi Grasso does it but I sure appreciate her talent. I have her watermelon sock yarn (yes, more watermelon socks are coming) and her heart sock yarn waiting in the wings to be cast on. 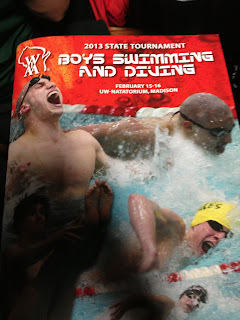 Oh, and by the way, the meet we went to was the State Tournament for the high school boys. Our boys are done with high school swimming so we just went to support the team and to enjoy the meet which was really fun (way more fun) without all the pressure. The photo above is of the cover of the meet program. See that guy with the huge mouth (he looks like me) on the cover? That's a photo of my son from last year. The photo I took of the program isn't very good. I took it at the meet to send to my son so he could see he was on the program cover. His response was a simple, "Funny." I shared this photo on Instagram and Facebook, but it is worth sharing again here. Remember Miss Molly's Gaptastic Cowl? Click here to see Miss Molly's cowl. Peachy loved it so much that she wanted one for herself. She selected the Twig colorway in the Quince & Co. Puffin. It's only $9 a skein... such a good deal when you compare prices for other 100% wool bulky/superbulky weight yarns. Love that. I've got a good start on Peachy's version of the cowl. I am knitting on US size 13, 24-inch circular needles and I've burned through one of these yarn cakes already. This is about the simplest cowl you could find. 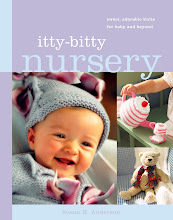 Seed stitch is it, knit and purl and purl and knit. I love simple stuff like this every once in awhile. 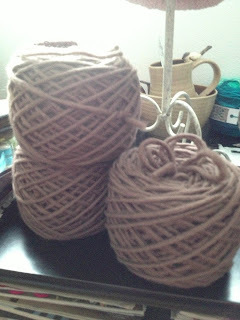 Isn't that yarn dreamy looking? I have finished the first sleeve and have about 5 inches done on the second sleeve for the Sipsey's Folly sweater. The sleeves are going slow for a couple of reasons, they aren't that interesting and I can't wait to get to the colorwork yoke. Progress is good but not fast enough. You can see the finished Sipsey's Folly sleeve under my sock knitting in the photo above. After I finished the Rainbows and Clouds socks I cast on the second sock from my handspun yarn from Dyeabolical roving. I have had the first sock done for a long, long time now and it needs a partner. I already have at least a few inches done on the cuff now. I'll keep you posted on the progress here. It seems to be going quickly. I promised myself that I would finish off these languishing second sock projects and I am working toward doing just that. I frogged (ripped out) a 3-inch ribbed cabled cuff of a sock that had been sitting for a couple of years in my studio. I never felt like working on it so I decided it needed to go. That felt good. I'll leave with this photo from last weekend. We went on a crunchy snowy hike through our favorite conservation park located right in our neighborhood. We are so lucky to have this vast spread of woods, ponds and prairie land right in our backyard. That's TC and my husband above. They are quite a pair (of silly goofballs). Take care and have a wonderful weekend hopefully full of wool and knitting. p.s. Remember how I said I wanted to knit a shawl that crosses over in the front and ties in the back on the shawl wearing video? 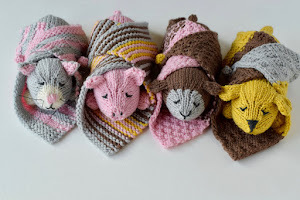 I was so excited to see this post about a sweet "sheep to shawl" version that does just that. Look here. Love the turtles and I can't wait for the pdf to be available. 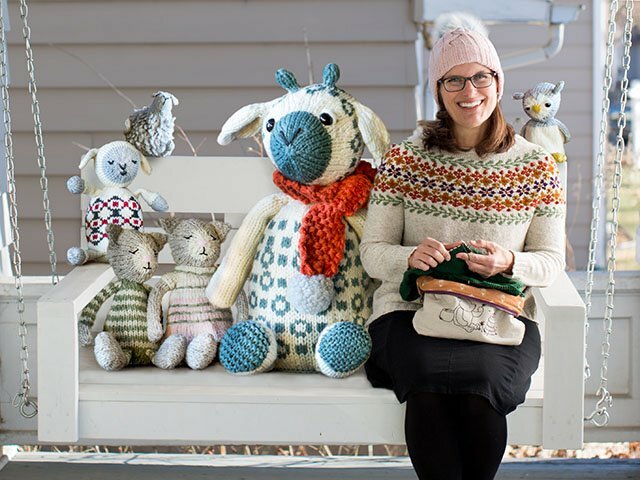 Perhaps you'll be appearing at a yarn shop near me? I am waitng for the pattern too! Didn't realize you were at the meet last weekend. The Memorial guys were fabulous. I was so happy for them! They worked hard and deserved the first place trophy. I was timing in Lane 7, so no knitting for me but I had a wonderful view of the meet. I love that park, too (I know I've made that comment here before, but it bears repeating.) I have walked there with my daughter and spotted wild turkeys. I love that. Those turtles are the cutest! I am so Happy to hear that you will be @ Maryland Sheep & Wool my Sister and I always go and will look forwaed to meeting you. Maryland! If you want to shop, go early because it gets really, really crowded by noon on Saturday. It's the mother-of-all sheep and wool festivals. What a great little pattern. Love your toys. I also love the needles you are using. Wish I had some. I'll get to see you at MDSW!!!!!!!!!! So excited! Cannot wait for the turtle pattern. You are not going to be in Germany any time soon :-)? Please post it soon. I love your egg to turtle toy - my middle son is a big fan of turtles and he would go crazy for a toy like this. Excited to see your new book - I hope you'll be stopping in the Twin Cities on your tour! 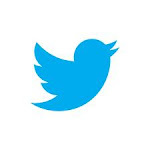 Thanks once again for sharing so much good stuff with us. 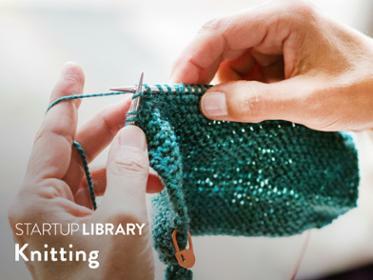 Are you coming to Stitches in Schaumberg, SOAR, or VKLive in Chicago this fall? 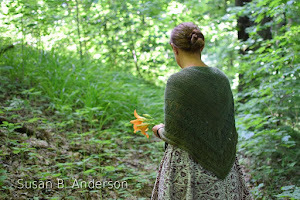 There are 2 lovely patterns for a wrap around-tie in the back shawl. They are both in Jane Austen Knits magazine. First one is called Margaret Dashwood Shawl by Joanna Johnson, Summer 2012 and the second one is called A Sensible Shawl by Celeste Young in the Fall 2012 issue. Both are lovely! 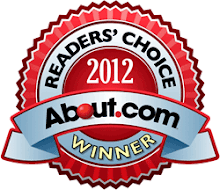 Long time reader, love your blog and that you include us in your family activities! I unfortunately do not live anywhere near where you are speaking/giving classes so will have to wait for what will seem like an eternity for the Little Turtle Pattern. 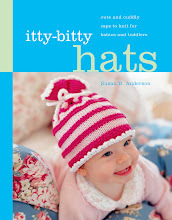 I would have loved to knit if for a sweet little girl in my life. It has got to be one of the cutest things ever as is your Wee Sheep! You're incredibly creative, love seeing all you work! Hi Susan, I'm so excited you're coming to the DC area! I'll definitely come check out your workshop at Fibre Space. I've not been to the MSWF before but have been planning to go this year for the first time myself. I should tell you that while I've only been knitting a little over a year, I'm fully addicted and your work has been a big part of what has inspired me. 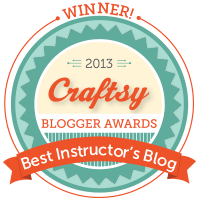 I first "discovered" you from the Spud & Chloe blog, knit your Dreamcatcher blanket as my first project and have enjoyed keeping up with you since. So thank you! 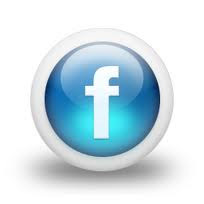 I would like to know how we may find you @ Maryland Sheep & Wool , do you have a booth location. 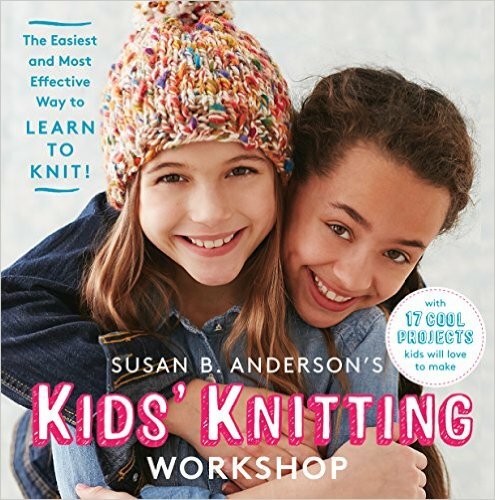 RRM - Maryland Sheep and Wool canceled author book signings so I am not attending. I am so sad not to be there... Have fun though! I hope it's a great weekend.